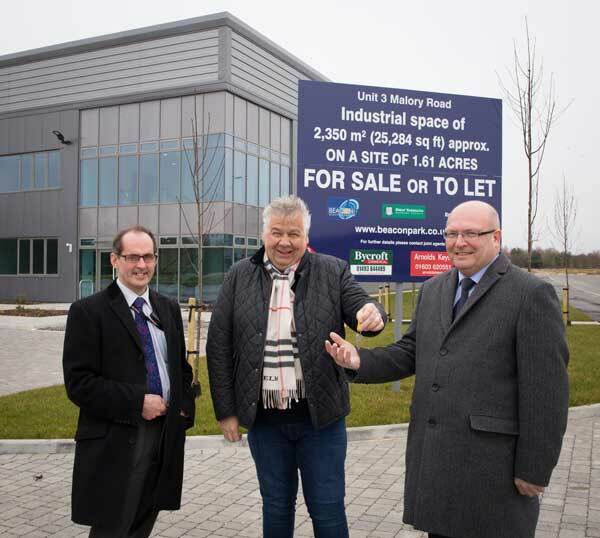 Two new industrial units, targeted at growing energy sector businesses, have now been completed on Beacon Park as part of continuing efforts to boost the local and regional economies. The medium-sized high-quality units, developed by Great Yarmouth Borough Council, could bring up to 100 jobs to Beacon Park, a growing energy sector hub on the Great Yarmouth and Lowestoft (New Anglia) Enterprise Zone and adjacent to the new A47 (former A12)/A143 link road. Representing a £3.6m investment in the local and regional economies, the buildings were officially handed over this week to Cllr Graham Plant, the borough council’s leader, following about 12 months of work by construction contractor ELM Contracts. The units were funded by the borough council, together with Government infrastructure funding, which in recent years has enabled the phased development at the park of units and other infrastructure, including a new internal access road providing access to the two new units and three privately-funded bases for energy sector businesses. Beacon Park represents one of the borough council’s priorities, which is to work with partners to build on creating conditions for further private and public investment, ensuring the borough and wider region is best placed to capture sustainable growth and its benefits for local communities, including new jobs. Cllr Graham Plant, the council leader, said: “In the coming years, Great Yarmouth has very bright prospects for benefitting from billions of pounds of investment in energy, including in offshore windfarms and gas platform decommissioning. Beacon Park is a good example of where investment in infrastructure, such as these units and the link road, is unlocking space for businesses to grasp these huge opportunities, invest further and create jobs. The units measure approximately 25,000 sq ft and 12,000 sq ft, of which about 10 per cent in each is office space. The high-specification development includes secure vehicle turning, loading and unloading areas, dedicated car parking space and generous levels of landscaping. Chris Starkie, managing director of New Anglia Local Enterprise Partnership, said: “We’re delighted to see Beacon Park continue to go from strength to strength, offering a vibrant home for businesses to thrive, creating jobs and growing the local economy.